If the red planet is sterile, a human presence there would create no moral or ethical dilemmas on this front. But if life does exist on Mars, human explorers could easily lead to the extinction of Martian life. As an astronomer who explores these questions in my book "Life on Mars: What to Know Before We Go," I contend that we Earthlings need to understand this scenario and debate the possible outcomes of colonizing our neighboring planet in advance. Maybe missions that would carry humans to Mars need a timeout. Mars qualifies, as do at least two other places in our solar system. Both Europa, one of Jupiter's large moons, and Enceladus, one of Saturn's large moons, appear to possess these prerequisites for hosting native biology. I suggest that how scientists planned the exploratory missions to these two moons provides valuable background when considering how to explore Mars without risk of contamination. Below their thick layers of surface ice, both Europa and Enceladus have global oceans in which 4.5 billion years of churning of the primordial soup may have enabled life to develop and take root. NASA spacecraft have even imaged spectacular geysers ejecting plumes of water out into space from these subsurface oceans. NASA's Galileo mission explored Jupiter and its moons from 1995 until 2003. Given Galileo's orbit, the possibility existed that the spacecraft, once out of rocket propellant and subject to the whims of gravitational tugs from Jupiter and its many moons, could someday crash into and thereby contaminate Europa. Such a collision might not occur until many millions of years from now. Nevertheless, though the risk was small, it was also real. NASA paid close attention to guidance from the National Academies' Committee on Planetary and Lunar Exploration, which noted serious national and international objections to the possible accidental disposal of the Galileo spacecraft on Europa. To completely eliminate any such risk, on Sept. 21, 2003, NASA used the last bit of fuel on the spacecraft to send it plunging into Jupiter's atmosphere. At a speed of 30 miles per second, Galileo vaporized within seconds. Fourteen years later, NASA repeated this protect-the-moon scenario. The Cassini mission orbited and studied Saturn and its moons from 2004 until 2017. On Sept. 15, 2017, when fuel had run low, on instructions from NASA Cassini's operators deliberately plunged the spacecraft into Saturn's atmosphere, where it disintegrated. Mars is the target of seven active missions, including two rovers, Opportunity and Curiosity. In addition, on Nov. 26 NASA's InSight mission is scheduled to land on Mars, where it will make measurements of Mars' interior structure. Next, with planned 2020 launches, both ESA's ExoMars rover and NASA's Mars 2020 rover are designed to search for evidence of life on Mars. 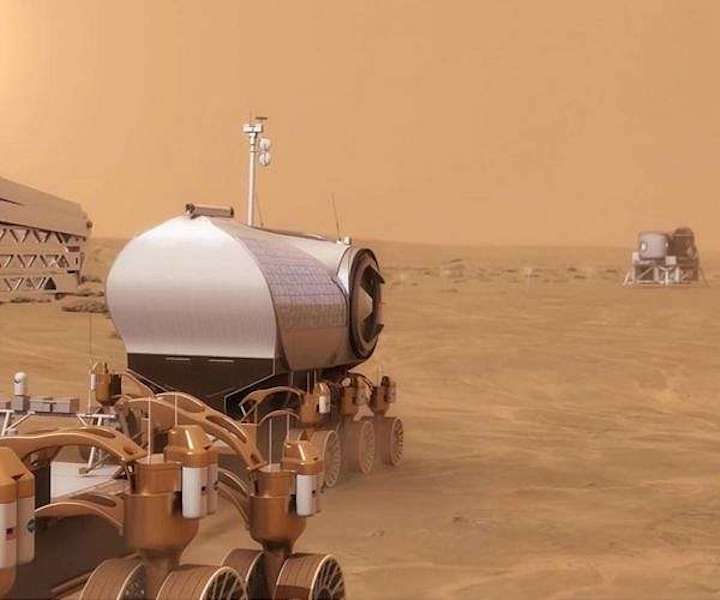 The good news is that robotic rovers pose little risk of contamination to Mars, since all spacecraft designed to land on Mars are subject to strict sterilization procedures before launch. This has been the case since NASA imposed "rigorous sterilization procedures" for the Viking Lander Capsules in the 1970s, since they would directly contact the Martian surface. These rovers likely have an extremely low number of microbial stowaways. Any bacteria that sneaked rides inside one of the rovers might arrive at Mars alive. But if any escaped, the thin Martian atmosphere would offer virtually no protection from high energy, sterilizing radiation from space. Those bacteria would likely be killed immediately. Because of this harsh environment, life on Mars, if it currently exists, almost certainly must be hiding beneath the planet's surface. Since no rovers have explored caves or dug deep holes, we have not yet had the opportunity to come face-to-drill-bit with any possible Martian microbes. But when Earth sends astronauts to Mars, they'll travel with life support and energy supply systems, habitats, 3D printers, food and tools. None of these materials can be sterilized in the same ways systems associated with robotic spacecraft can. Human colonists will produce waste, try to grow food and use machines to extract water from the ground and atmosphere. Simply by living on Mars, human colonists will contaminate Mars. Contaminating Mars isn't an unforeseen consequence. A quarter century ago, a National Research Council report entitled "Biological Contamination of Mars: Issues and Recommendations" asserted that missions carrying humans to Mars will inevitably contaminate the planet. I believe it's critical that every attempt be made to obtain evidence of any past or present life on Mars well in advance of future missions to Mars that include humans. What we discover could influence our collective decision whether to send colonists there at all. Even if we ignore or don't care about the risks a human presence would pose to Martian life, the issue of bringing Martian life back to Earth has serious societal, legal and international implications that deserve discussion before it's too late. What risks might Martian life pose to our environment or our health? And does any one country or group have the right to risk back contamination if those Martian lifeforms could attack the DNA molecule and thereby put all of life on Earth at risk? But players both public - NASA, United Arab Emirates' Mars 2117 project - and private - SpaceX, Mars One, Blue Origin - already plan to transport colonists to build cities on Mars. And these missions will contaminate Mars.